Tru-Weld Stud Welding has been making quality weld studs since 1959, and since 1970 we have been producing our own line of high-quality equipment for stud welders. Tru-Weld is located in Medina, Ohio and has distributors across the nation. Our 155,000 square-foot facility allows us to stock many of the common lengths and diameters to help ensure a faster delivery time. For the professional stud welder looking for quality, American-made weld studs and equipment, Tru-Weld offers a full line of weld studs in mild steel and stainless steel; in fully threaded, partially threaded, shear, headed, and other styles; and for both Drawn Arc and Capacitor Discharge machines. 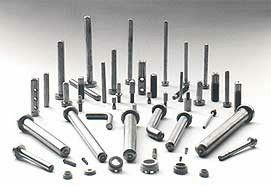 In addition, we stock stud welding equipment and accessories that work with our studs as well as competitor brands. Choose one of the below categories for specific product information, packaging details, shipping weights and other technical info. Tru-Weld manufactures and stocks a full line of weld studs in mild steel and stainless steel for any type of application. 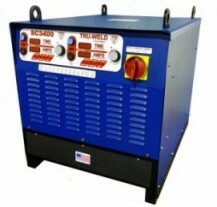 Tru-Weld Equipment manufactures a full line of stud welding equipment for any type of application. Tru-Weld Equipment carries a full line of stud welding accessories for any type of application. Strict adherence to our quality control procedures registered to ISO 9001:2008 standards ensures our customers receive quality products. Furthermore, Tru-Weld has complete traceability to mill material test reports and provides its customers with certification of each heat number purchased. Our experienced Management and Staff is committed to provide the utmost in quality and service in every step of our production, while remaining competitive in the marketplace. It is our goal to meet our customer's needs more effectively than our competitors through a process of continuous quality improvement. Our long-standing relationship with our customers; and suppliers' is our key to continued success and growth. If we can be of any further assistance to you and your company, please do not hesitate to contact us. We at Tru-Weld invite you, our valued customer, to our facility for a quality audit. We will be honored to provide you with a plant tour so that you can witness, in person, how our weld studs are produced and how we handle material control, traceability, packaging and documentation. We want you to have complete confidence that you are partnering with a company who shares your same ideals for quality and service.